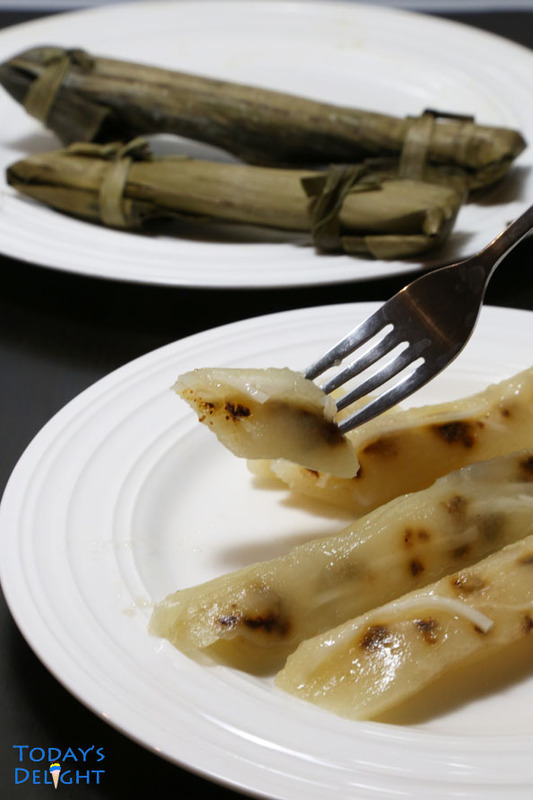 Cassava suman is a Filipino delicacy made with grated cassava (kamoteng kahoy ), coconut cream or grated coconut and sugar. My aunt’s cassava suman recipe with latik and shredded young coconut meat is the best. All the ingredients I used to make the cassava suman were all pre-made except for the latik (coconut granules). You can get frozen grated cassava, frozen shredded young coconut meat, banana leaves and canned coconut milk in Asian stores. I’m not aware if they have pre-made frozen latik too. It is optional to add the young coconut meat and latik but I never omit these two ingredients when making cassava suman. They add flavor and texture. When we were growing up we visited my Mom’s home town of Nueva Ecija once or twice a year. Cassava suman is one of my aunt’s specialty. Me and my brother devoured the suman like we’ve never had it before. For some reason, my mom never made this. On our trip home my aunt would always hand us a big bag full of cassava suman. What does the term “Suman” mean? 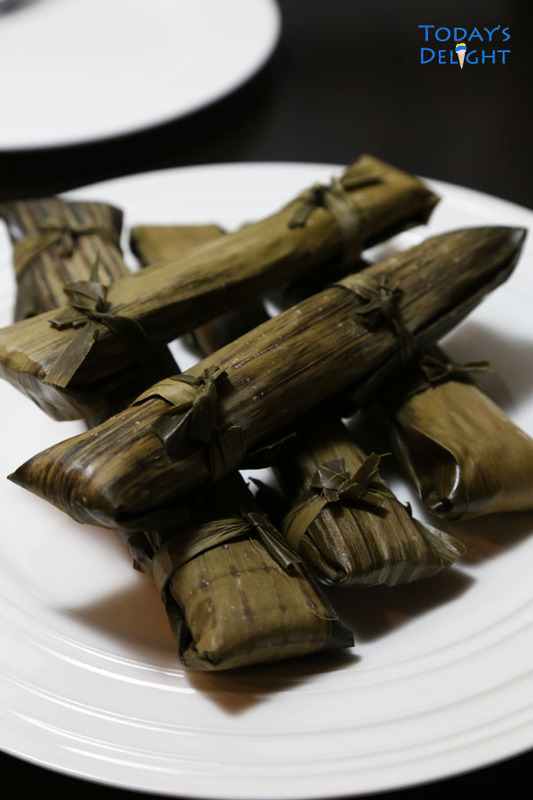 Suman usually refers to Filipino rice cake made of plain or glutinous rice flour. 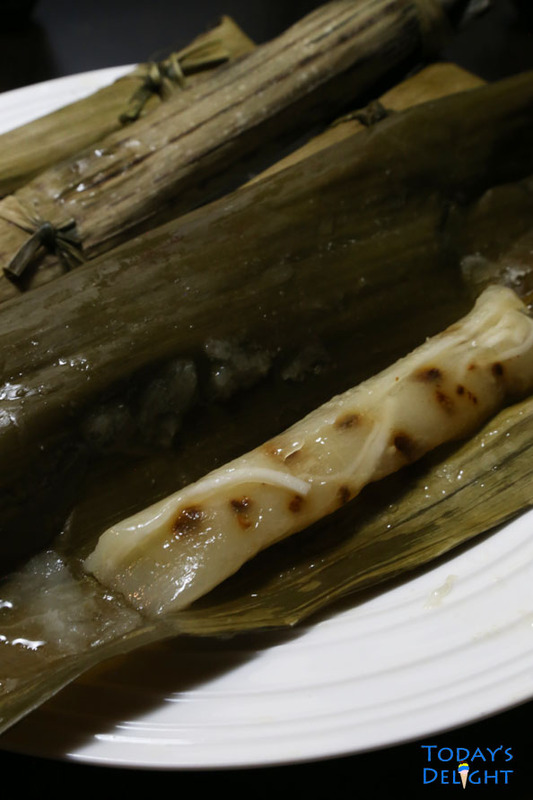 In this case, the recipe for cassava suman is made of cassava. When I moved to the States this is one kakanin that I miss a lot. Relatives usually brought back cassava suman when visiting the Philippines but it was not as good since it was frozen and not fresh anymore. For years me and my cousin tried making it but it was not the same. We made it with grated coconut or coconut cream but the texture was not close to my Aunt’s suman. It tasted fine but the consistency was not the same. So we finally gave up. Then one day after a few years I got intrigued again to making it. I called my Aunt and compared my recipe with hers. My recipe was right. The only thing different was I steamed mine while she boiled hers. So I made it again and boiled it in water. Yes, that was the trick. Finally, I got the texture I was looking for. I can’t believe for years we did not figure that one out. I have noticed the same thing when making Filipino tamales. I like it boiled than steamed. Finally, we can have cassava suman any time we have a craving for it. Now it is also one of the kakanins served during our Christmas gathering. Kakanin is a Filipino term referring to all native delicacies. Cassava suman for example is categorized as kakanin. 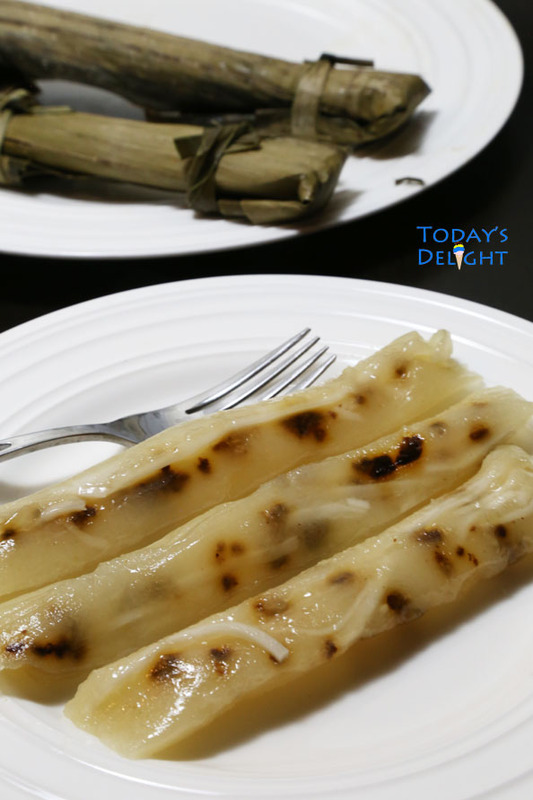 If you’ve never had Cassava Suman with latik and young coconut meat try this recipe. It is simple but delicious and one of our favorite snack (merienda) or kakanin. Watch my video “How to make Cassava Suman recipe with latik and young coconut meat”. Magluto na tayo! Cassava Suman is one of the popular Filipino delicacy (kakanin) made of grated cassava, coconut cream and sugar but made special with latik and shredded young coconut meat. Place the canned coconut milk in the fridge for 2 hours. When you open the can the cream will form on the top layer. It is best to use the cream instead of the liquid portion. Prepare 10 wilted banana leaves measuring about 6 inches wide by 10 inches long. Wash the banana leaves and pat dry with a paper towel. Turn the stove on low and pass both sides of the leaf on top of the burner until soft and flexible. Set aside. Add grated cassava and sugar in a bowl. Mix well. Lay a banana leaf and place ½ cup of cassava mixture 1 ½ inches away from the edge of the banana leaf. Spread the cassava mixture thinly about 5 inches long forming a log. Add latik and shredded young coconut meat on top of the cassava mixture. Fold the edge of the banana leaf covering the cassava mixture and roll tightly. Fold both ends and tight with a twine or banana leaf strips. Repeat the process. On a wide deep skillet add and boil water enough to cover the cassava suman. When water is boiling lower heat. Add the cassava suman and simmer for 45 minutes. Cassava suman should be submerged in water. Once done place cassava suman in a strainer to drain.